We really cannot think of any iconic D&D creature as beloved as the humble Kobold. They’re famously squishy – the basic 5e version has 5hp in total – and should in theory be a pushover for any halfway competent party. Nevertheless, the little blighters are tricksy in ways most players can only marvel at, laying traps and ambushes with a malevolent glee that fills our hearts with happiness. For a full-size version of this image, click here. The 4e Kobolds had rather a lot of spellcasters cluttering up their ranks, so we decided to draw up some modern equivalents. 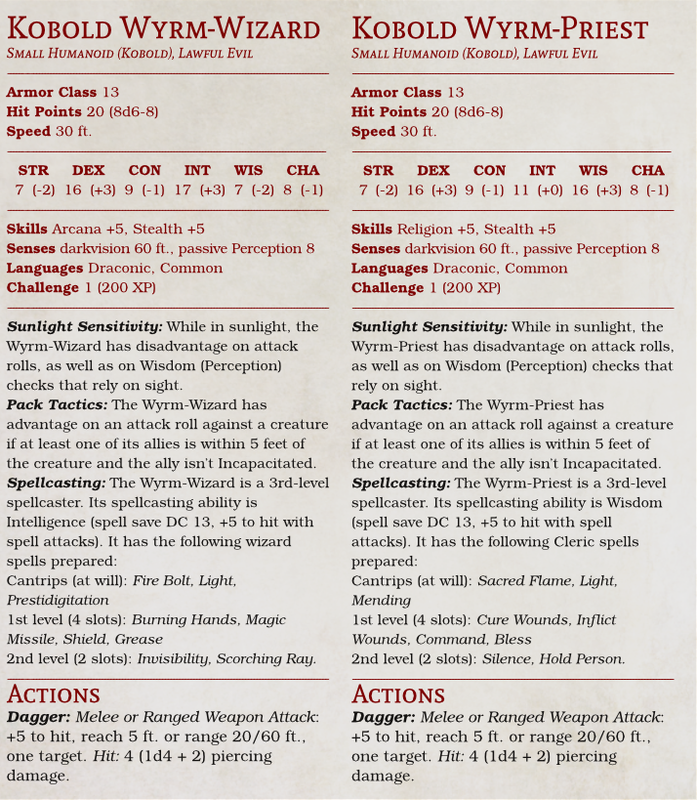 The choice of spells is up to the DM, of course, but we went with the most appropriately annoying options we could. Between Silence and Command, the Wyrm-Priest alone can cause real havoc, if not all that much damage.